It is common to be offered a small bowl of salsa with some chips when you are seated at a Mexican restaurant. Here in the United States, some of the restaurants use canned tomatoes to make it, but using fresh tomatoes will always render the best salsa. My mom would almost always have this salsa ready, as it can be used for many things, like the famous Huevos Rancheros, scrambled eggs with salsa, entomatadas, or to add to the many typical Mexican meals we call “antojitos”. When we talk about salsas, the combinations are endless: they could be as simple as the raw serrano salsa, or a little more complex with more flavor like a Piquin Salsa. A few tomatoes (or tomatillos), onion, garlic, and peppers are the soul of a salsa, but not all of them are hot, spicy salsas. Sometimes, we use a salsa to add some heat to a meal, while other times it constitutes an actual part of the dish, like with the Dried Shrimp Patties in Guajillo sauce. 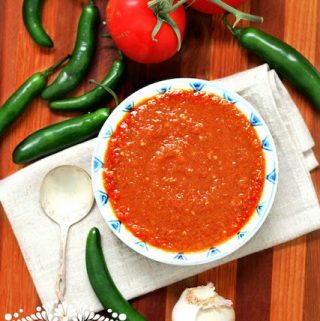 Salsas are in our everyday life, and almost always you will find a homemade salsa at every Mexican dining table. Which brings me to this last note: we also call them “Salsas de Mesa”, or “table sauces”, since they are placed on the table when the meal is served. Place in your blender with ¼ cup of water, and process until smooth. Heat the oil in a medium-size frying pan over medium-high heat, and pour in the salsa and stir. 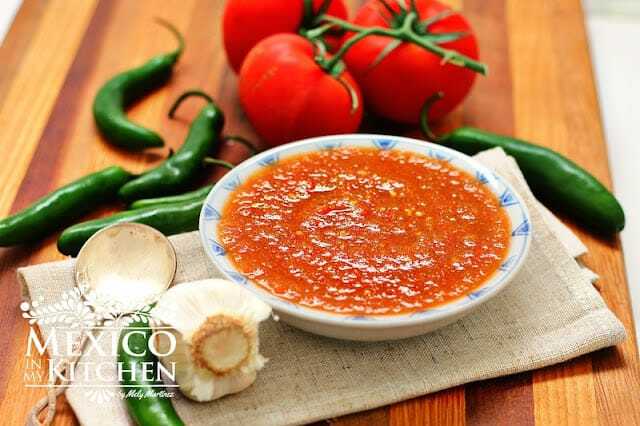 Once the salsa starts boiling, reduce the heat and gently simmer for about 13-15 minutes, stirring from time to time, until all the ingredients are well cooked. Once done, season with salt and serve. Serve with warm tortilla chips or use on tacos, fried eggs, tostadas, etc. Roughly chop tomatoes, serranos, garlic clove, and onion. Place in your blender with ¼ cup of water, and process until smooth (or slightly coarse, if you prefer). 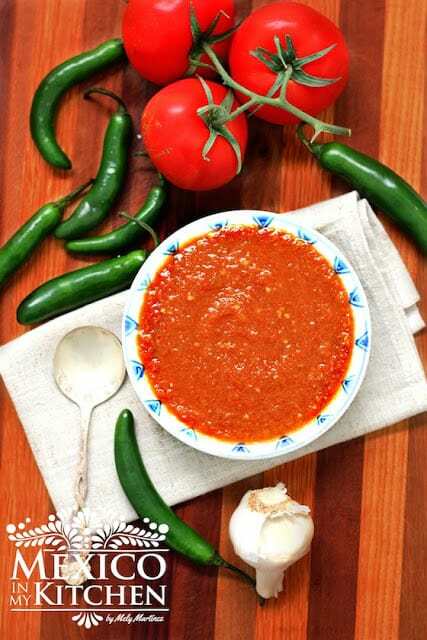 Once the salsa starts boiling, reduce the heat and gently simmer for about 13-15 minutes, stirring from time to time, until all the ingredients are well cooked. If it needs it, add more water; this will depend on how juicy the tomatoes are. Once done, season with salt and serve. This sauce will keep well for about 3 days in your refrigerator. • If Serrano peppers are not available, use 1 jalapeño pepper. • Some cooks add cilantro. If you want to add it, use about ¼ cup of chopped cilantro and add to the rest of the ingredients in the blender. 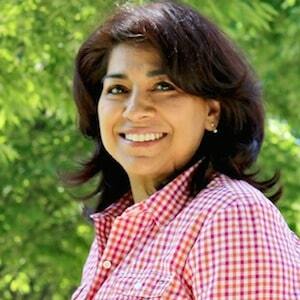 Me encantan tus recetas! Muchisimas gracias! We live in phoenix where we take our salsa seriously and this is spot on, made it two hours ago & it's nearly gone. Thank you for trying the recipe, I bet you are an excellent cook! love your salsa, i thought i was the only one that fries my chili. I think the frying the salsa enhances the flavor of the salsa as a whole. Thumbs up your salsa is awesome…..
You are absolutely right! Frying the salsa enhances its flavors. My mom always fries her salsa, and many other home cooks do. it is just another way to make a good salsa! Happy cooking! Very good! I added some tomatillos and more garlic and wow spicy but I can’t stop eating it. Thank you! MMartinez, I have a question. Do you have a recipe for HOT restaurant style sauce? I don’t know how to describe what I’m looking for except to give examples. I live in AZ and my favorite restaurants are Valle Luna, Ajo Al’s, and PoPo’s. They bring you their regular salsa with chips and then I ask them to bring out their hot salsa. It’s deep red and puréed or thick liquid. (Not Tabasco sauce). I just wish I could learn to make salsa just like they do. Does that sound like a recipe that you have? 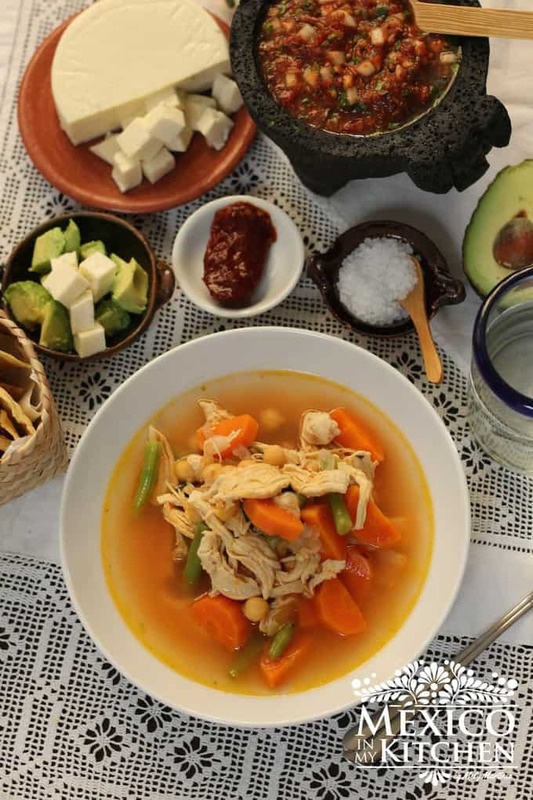 Every restaurant usually has their own recipe, and that usually will be their cooks’ recipe depending on the region they are from (in Mexico). Hot salsas can be made with so many variations. When I moved to Texas, I found out that several restaurants in my neighborhood offered a red-hot salsa. Asking around I managed to get the ingredients to make my own salsa at home. Here are 2 links to some salsas that can be similar to what you are looking for. Have fun and experiment with hot peppers. 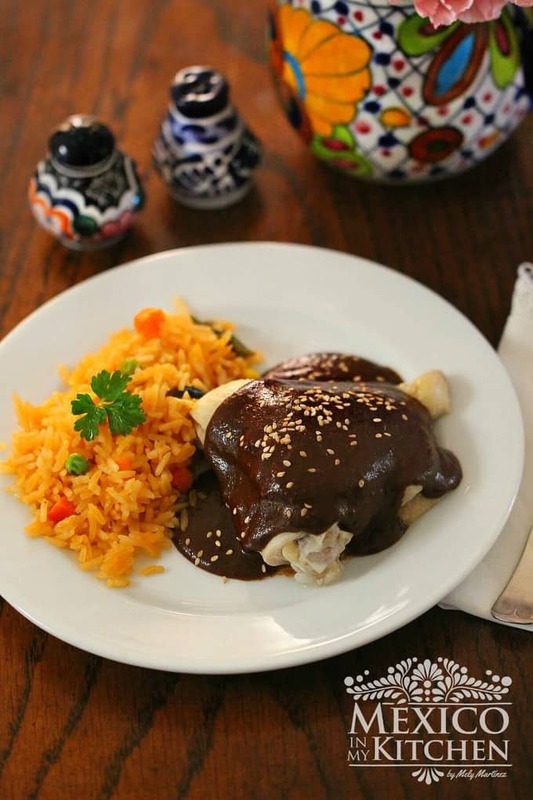 This one if from Texas:https://www.mexicoinmykitchen.com/2016/02/red-taqueria-style-salsa.html Note, just add the chicken bouillon little bit little and taste. Looks delicious! I would never have thought salsa could be “fried”. I’ll give this a try very soon. I make a delicious salsa which uses canned tomatoes. I imagine the fresh tomato will really provide a different flavor. The number of tomatoes and peppers used in salsa will indicate the amount of salsa to make. Usually, a recipe will say how many cups of salsa you can make with that amount. As for how many peppers, well, if you can tolerate the heat, you can add as many as you like. The same applies to the garlic, so many people in Mexico, skip adding the garlic or the onion. You can actually make a good salsa only using tomatoes and peppers. This salsa came out great and the recipe is wonderful! Two thumbs up for sure ! Sometimes, when the peppers are old they lose their dark color. Maybe that’s why your salsa came to be a little lighter in color. You cna also add more peppers next time. I lived in Mexico many years and now I’m back in Montreal. Now if anyone could tell me how I can get serrano chiles here in Montreal, they would really be a hero! You can often see jalapeños, and yesterday I saw some at the supermarket… @ $7 for four!